How do you know when your dog needs to go out? How do you know when your dog wants a belly rub? Domestic dogs have a way of communicating with their humans without making a sound. Not all requests are for treats or snuggles. Sometimes your dog is asking for help. These are the behaviors and signals to watch for when your dog needs more than just your love. In fact, research has been done to figure out what certain behaviors mean. These are some of the most common behaviors and what they may indicate. Yes, you know dogs love to eat. Some even beg for food. There’s a difference between puppy dog eyes staring you down while you eat a hotdog versus a dog that’s got a hungry belly. A study from Animal Cognition looked at 19 dog gestures and determined what they most likely meant. When your dog flicks a toy in front of you, it means they want something to eat. The research defined flicking a toy as, “holding a toy in the mouth and throw it forwards, usually in the direction of a human.” The next time you’re sitting in the front of the TV or typing at your desk and your dog brings a toy over, they might be asking for a snack. Watch them carefully. Digging is a very common dog behavior. Cesar Milan says it’s a natural form of exercise or way to burn off excess energy. However, your dog could be telling you something else by doing this. It could be a sign of fear. If you catch your dog digging during a weather event (like a thunderstorm) it may be a sign of their anxiety. Your dog might also use digging as a means of escape from scary neighborhood dogs or other potential threats. The next time you find your pup digging, think about what may be going on in their day. Some dogs, like Terriers, are natural diggers and others may be showing you a sign that they are afraid. 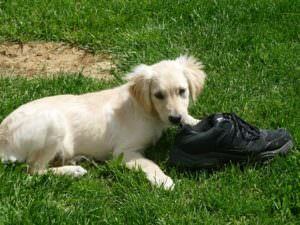 You’ve seen the cliched image of a dog chewing on a pair of shoes. There’s more to this than puppy antics or unruly behavior. Like digging, chewing can be a sign of anxiety, boredom or distress. If your dog is less than six months old, chewing may be a sign of teething. Like humans, dogs go through a period of losing their baby teeth. It can be painful when their adult teeth come in, and so puppies look for relief through chewing. If your dog is suffering through those growing pains, you can give her a cool washcloth to chew on. 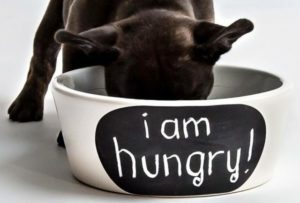 Dogs on a calorie restricted diet may chew on shoes and other things because they are looking for something else to eat. If your vet has introduced diet restrictions and you notice an increase in chewing, talk to your pet’s doctor. Dogs lick their humans for a number of reasons. 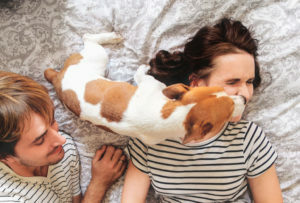 Your pup could lick you because she enjoys the taste of your salty skin or because she knows you’ll rub behind her ears if she licks your hand. However, licking can be a sign of other issues. Lots of licks can indicate anxiety or, in extreme cases, can be a sign of compulsive behavior. You may also notice your dog licking their feet frequently. This activity may be a sign of itchy paws caused by allergies. 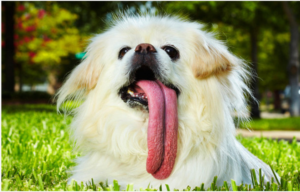 If your dog seems to lick endlessly, it could be an issue for your veterinarian to determine what your pup is allergic to or a behavior specialist, if licking is uber-persistent. Another way your dog silently asks for help is by displaying signs of dehydration. There are some obvious signals like dry-looking eyes and panting. But there are other signs to watch for on particularly hot days or after exercising your dog. If your dog acts lethargic, won’t eat, has a dry nose/gums, they could be dehydrated. There’s a simple test to determine if your dog is dehydrated. If you’re concerned that your dog may be dehydrated, gently pinch their skin. If the skin bounces back as soon as you let go, your dog is fine. But if the pinched skin continues to retain its shape or is slow to flatten, your dog is dehydrated. If your dog is showing those signs of severe dehydration, give your vet a call to determine the best course of action. Most of the time it’s very easy to tell what your dog wants. Rolls on his back? He wants a tummy rub. Place her tennis ball in your lap? She’s ready to play fetch. Barks when you walk in the door? He’s thrilled you’re home. But there are some less obvious cues. When your dog starts to behave abnormally (from his regular behavior), keep an extra eye on him. He may be telling you something and now you know better how to diagnose his actions.